MSI announced today the release of their CPU Guard 1151 product to combat potential CPU bending when using heavier coolers. If you have not already heard all the hullabaloo, there is a lively discussion going on in the forums. With the substrate of Skylake being thinner than that of the previous generation Haswell CPUs, larger coolers, specifically ones going beyond Intel’s 50 lb. pressure specification have been doing some damage. If you’re concerned, stick with spring-mounted heatsinks rather than bolts, or get yourself MSI’s CPU Guard 1151 shim. Details are thin, but the CPU Guard fits on the socket to prevent excess vertical pressure on the CPU. According to MSI, the product was used by expert overclockers to break world records in a recent event, although specifics were not mentioned. MSI also claims this solution works well with de-lidded Skylake CPUs, which was a bit of a surprise as Intel partners generally stay mum on modifications that void the warranty. All images courtesy of MSI. It is unclear as to whether this will be an included accessory with MSI motherboards or sold separately. 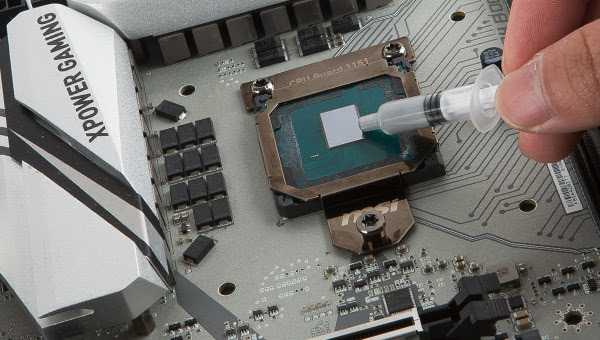 Since the 1151 socket is standardized across all motherboards, I expect this handy accessory would be compatible with most motherboards, assuming the socket area isn’t too crowded. Stay tuned for more details as they become available.